Best Lawyers has named Tom Kline its Philadelphia Medical Malpractice Lawyer of the Year, including for 2019, and Shanin Specter and Andrew J. Stern as Philadelphia Product Liability Lawyers of the Year while also selecting nine current Kline & Specter attorneys among its Best Lawyers in America. Kline & Specter has also been named among the nation's Best Law Firms for Medical Malpractice, Product Liability and Mass Tort Litigation. Kline, Specter, Stern, Lee Balefsky, Charles L. Becker, Kila Baldwin, James Waldenberger, Priscilla Jimenez and Nadeem Bezar were recently selected for inclusion in the 2019 and 25th edition Best Lawyers guide to legal excellence in the United States. 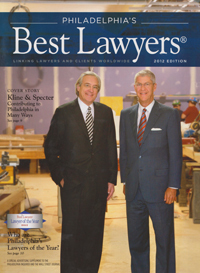 Best Lawyers had previously featured Kline and Specter individually in cover stories and together in 2012 with an article about their charitable giving. (See the article) The peer-review rating service noted that Kline and Specter each received national recognition for the 25th year. Tom Kline was named as Best Lawyers' top medical malpractice attorney in Philadelphia for 2013 and 2019 and as Philadelphia Personal Injury Litigator of the Year and Philadelphia Medical Malpractice Litigator of the Year for 2010. Specter was selected as Philadelphia Product Liability Lawyer of the Year for 2016, while Stern held the honor for 2015. Best Lawyers decided for the first time in 2009 to name Lawyers of the Year in six high-profile practice areas and in certain large legal communities, with Kline becoming the first in Philadelphia to win for the Personal Injury category. The selections are based on “a particularly high level of recognition from fellow attorneys." In addition, Kline & Specter has been selected as the nation’s No. 1 law firm for Product Liability plaintiff representation and for the “Tier 1” group – the top classification – among all firms in the United States for Medical Malpractice, Product Liability and Mass Tort litigation and also among the top firms in Philadelphia for general Personal Injury litigation. More than 10,000 firms were considered as part of the survey by U.S. News Media Group and Best Lawyers. Best Lawyers has over the past 25 years helped lawyers and clients find legal counsel in unfamiliar jurisdictions or unfamiliar specialties. Best Lawyers is the oldest peer-review publication in the legal profession. The publication compiles lists of outstanding attorneys in all 50 states and the District of Columbia.